Chrome River meets the challenge of today’s demanding workforce with its expense management solution, Chrome River EXPENSE. Use any device, anytime, anywhere to file expense reports and the solution is endlessly configurable to fit the way any business works. Chrome River makes employees happy and lets business flow, which makes AP departments, travel managers, and the office of the CFO even happier. If you like what you see in the video, be sure to request a full demonstration by filling out to the form to the right! Start an expense report when you purchase your flight on your desktop, add your taxi receipt from your mobile phone, and finish on your tablet on the flight home. And all with the same user experience on each device. A solution that ensures your business travelers stay in compliance with company T&E policies, is integrated with your online booking tool, your corporate cards, and your finance system. Automatic approval routing for expenses so that no one ever has to wait for reimbursement. Expense reports that don't care how many borders you cross, with multi-language, multi-currency, and tracking of global taxation rates built into the software. Chrome River is a powerful travel and expense management solution for mid-size organizations to the Fortune 500, serving all industries. 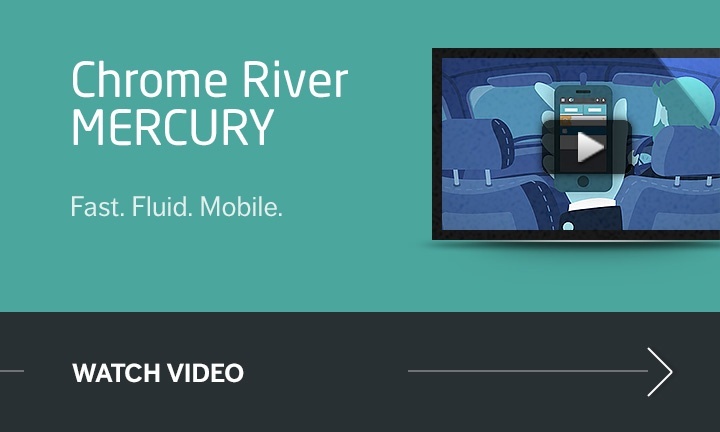 With no up-front hardware or software costs and a global solution that is quickly deliverable, Chrome River immediately improves your operations and provides an instant return on investment. And with our modern web interface, response time is lightning fast on any and every device regardless of size or shape.